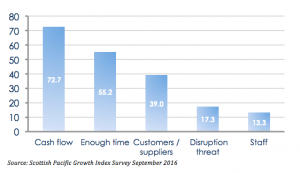 What keeps SME owners awake at night? 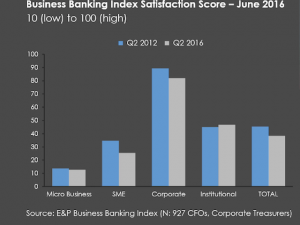 SMEs are finding it difficult to access bank funding, especially if they are not able to offer real estate security. Despite banks maintaining they are open for business, many small business owners believe that tightened credit standards are making it even harder to obtain bank support. 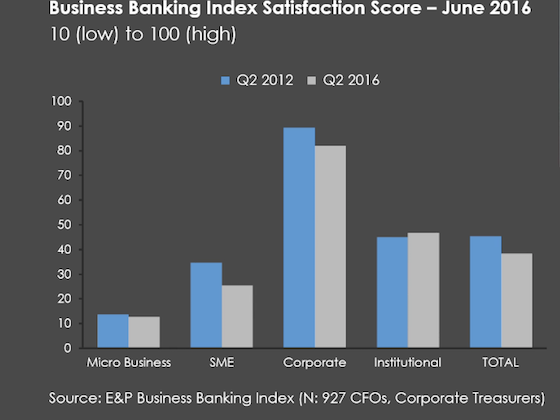 The chart below highlights just how poorly SMEs rate the banks and this sense of alienation is continuing. Fortunately, SMEs have options in the form of non-bank lenders, including the new breed of online or fintech lenders that are able to offer quick automated decisions and lend without tangible security. More than 20% of SMEs surveyed indicated they planned to fund their growth using a non-bank lender – this was up from 15% in September 2015. 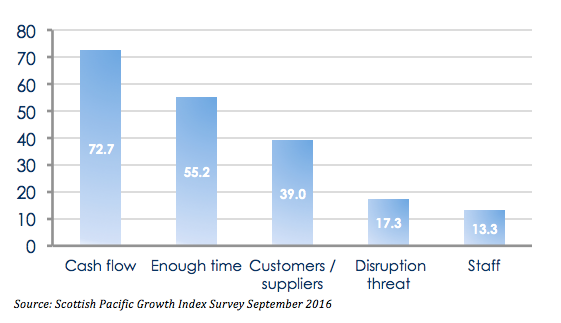 Almost one in four SMEs surveyed expect business revenues to decline in the next six months and the number of SMEs forecasting negative growth exceeds the number of SMEs who are expecting positive growth. The optimists are concerned about how to fund expected growth whilst the others worry about how they can remain profitable with declining revenues. As much as they would like to explore alternative ways of funding their business and improving their cashflow, many SMEs just don’t have the time. In all, life isn’t getting any easier for Australia’s SMEs. The Scottish Pacific SME Growth Index cites financial pressure and lack of time as key concerns but what it doesn’t address is the affect these and other concerns are having on the mental health of small business owners. There is an increasing awareness of SME mental health issues thanks to the great work being carried out by organisations like Beyond Blue and Heads Up, but more still needs to be done. The report is a timely reminder that we need governments, business associations, advisors, banks and non-bank lenders to all pull together to better support the financial health of our SMEs and the mental health of their owners. I really like this kind of posts. It gives me an opportunity to study how to make a top post or quality posts.. I blog quite often and I really thank you for your ideas. This article has really peaked my interest and keep checking for new information about once per week. Cheers. Good luck with your blogging! As a business owner since 2005, I’ve come across a number of small business owners who are happy to use services then don’t pay or are very slow to pay. It’s becoming more acceptable for Australian business owners not to pay their bills! – Setting a maximum figure on outstanding total invoices. So the customer/client does not receive more products or services until they have settled their outstanding account. – Get upfront pre-payment with as many customers/clients as possible – service plans, fixed price monthly plans, etc. – Pay as many big bills manually, not by automatic debit on your credit card or bank account. This can help greatly with cash-flow timing issues. – Ensure that GST payments to the ATO and employee entitlement and taxes are correctly budgeted for, and set aside in a separate bank account. Often cashflow problems are caused by not up-to-date books (accounts) and loose financial management. Hopefully, the above can be of some use. « Does your bank really want you as a customer?